Our beloved lake country in the off-season. Every August, for one week, we make Crow Wing Crest Lodge our home away from home. 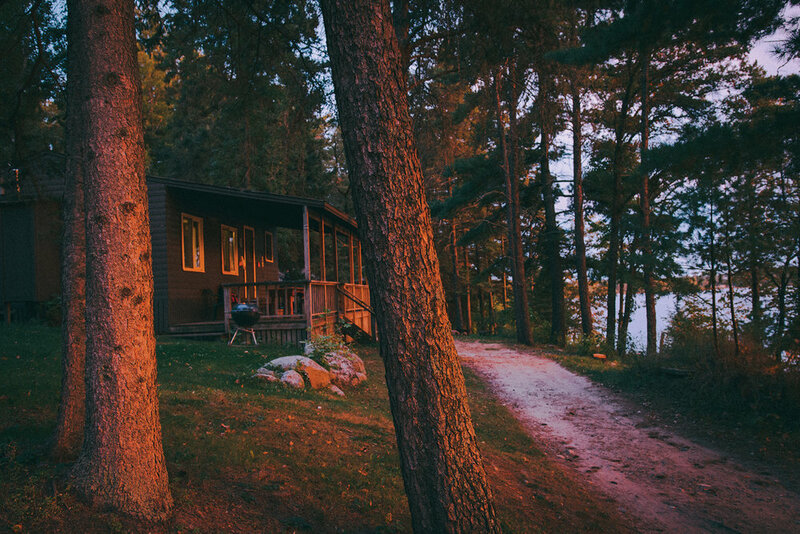 Nineteen cabins — plus camping grounds, a communal lodge, a sauna and more, are nestled into a sprawling hillside overlooking 11th Crow Wing Lake in northern Minnesota. It has been a beloved tradition since my younger sister Addie was just a baby and I just a toddler. Some time ago the resort changed hands and the current owners practice reflexology, aromatherapy and other forms of naturalistic healing and wellness for body and soul. Every fall they host a weekend retreat for people seeking restoration at the lake, which Addie and I had talked about attending for a while. 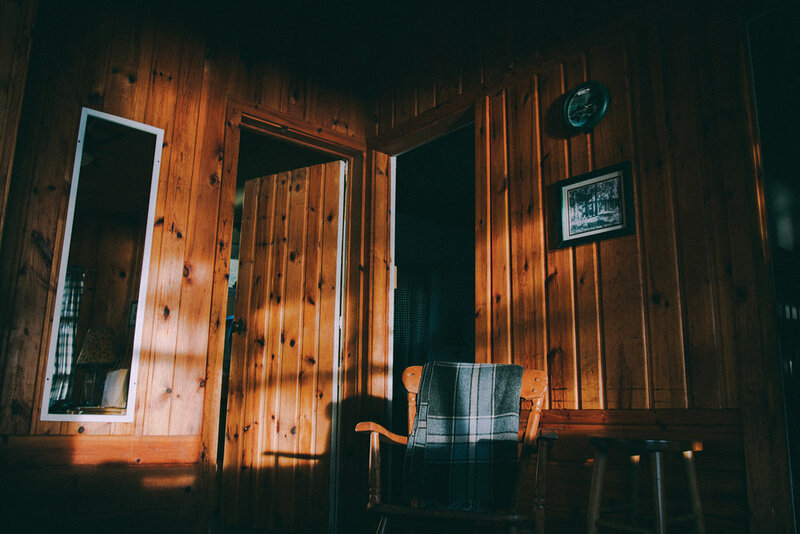 We finally took the plunge and booked ourselves a private cabin — one that was decidedly more rustic than our usual accommodations, but which suited us tremendously. We made the trek from Minneapolis to Akeley on a Friday afternoon and arrived as the sun was setting behind the trees. The sky was awash with purple and orange. It hadn’t been long since we were last there — only 5 weeks, for our annual summer vacation — but the place was completely changed. The grounds were silent and still. There was a fire going on the beach, but not accompanying loud voices and laughter. There were no fishermen trolling the lake for an evening catch, or sounds of children playing. There wasn’t even the typical sound of screen doors slapping against cabins. It was just quiet, and the air was chilly. I was surprised to find September to be so drastically different than August. But the seasons change more precisely the farther north you get. Back home, they will drag and blend together endlessly. I made dinner in the spartan kitchen, which was just the right size for one person. We turned up the old radiator, slipped on our wool socks and sat and relaxed for a time, before we decided to see what the activity at the lakeside sauna was like. The sauna at CWC is old-fashioned and a bit rickety and powered by wood fire. The smell of cedar is intoxicating. Addie and I did a round or two in the sauna — the lake was ice cold — and decided that in this new environment maybe that was enough. We headed back to our cabin. When our family first came to CWC, our home was Cabin 6, which at the time was cramped, with small rooms and uneven floors. It was also one of the oldest cabins on the property. When the new owners started to renovate and rebuild other cabins, we leveled up until we ended up in Cabin 19, where we’ve been since 2004. It is really more like a serene lake house than a cabin, high up on the hill surrounded by venerable old white pines, overlooking the lake. For the fall retreat, Addie and I stayed in Cabin 11, which was closer to Cabin 6 in every way, and almost something of a treat for us hopeless nostalgics. The creak of the door, the smell of the radiator, the basic but functional furnishings. The cabin was tastefully decorated for its environment with a taxidermied deer head and vintage photos of the resort back when it was a logging camp at the turn of the century. Sitting in the small living room after a night at the sauna felt like taking a time machine back to adolescence. The next morning we woke up early on purpose so we could drink our coffee in the morning light on our little deck. Addie and I are similar in a lot of ways; we like scenes or vignettes to be carefully curated. We wore sweaters and thick wooly socks. I brought my French press and Stanley thermos and we cooked cozy meals and dined on quaint cottage plates. Having a coffee on the deck at daybreak, listening to the lake lapping at the beach, was picture-perfect. Breakfast was made: Swedish pancakes. We sat and soaked up the quiet. I spent some time sitting on the dock and feeling the cool lake breeze mix with the warm autumn sun. It was heaven. We drove the 10 miles to Walker along Highway 34 — dubbed the “Lake Country Scenic Byway” — to take a day hike on the North Country Trail, which stretches 4,600 miles from North Dakota to New York. We walked in peace around little lakes and across prairies until the distant sounds of hunters’ guns were becoming less distant, and we decided we didn’t want to be someone’s prize, so we headed back. For our final day I made a breakfast of vegetable hash and eggs in the cast-iron skillet and we did an exploration of Chippewa National Forest, which, for having been there the whole time we’d been coming here, was pretty much unknown to us. From the road you can see how the area is heavy with coniferous trees and the land dips and rises. For our entire trek we hardly saw another soul except for the occasional fellow retreat attendee, but we mostly all kept to ourselves. That afternoon I sat on the couch while the sun set on the lake behind me and filled our cabin with light. Addie cooked dinner: a coconut curry soup (pg. 52) which was most welcome on a chilly fall night. We packed up our things a little for the early drive home the next day, but there wasn’t much to pack. Whereas our summer vacations tend to be overstuffed with things we may need — probably too many clothes, too many board games, too many toys and gadgets — we had come to this retreat with only what we knew we needed, a simple bag or two and some groceries. The barest necessities, plus a few creature comforts, is how it ought to be. If I ever happened to find near the 11th Crow Wing Lake any time of year outside of August I had made a point to never take the dirt road down to see the old place, as much as I would like to. Our time there once a year is sacred. I’ll admit I worried that heading back so soon after leaving — and without our usual trappings — would sully the whole place for me. I couldn’t have been more wrong. My love grew with the seasons.